Louella O. Parsons, date unknown. 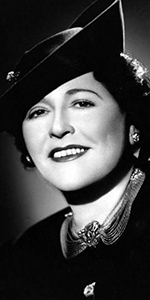 Louella Parsons was famous in Hollywood as the author of a gossip column, from 1923 to 1965, in the Hearst Syndicate newspapers. If public relations and the press fuel insterest in the movies, Parsons has to be considered a prime force in the business. Born to a German Jewish father and an Irish mother, young Louella was brought up Episcopalian. The family moved to Dixon, Illinois, when she was nine. Already gravitating to writing and journalism, she gave the valedictorian speech at her high school graduation. Studying to be a teacher in college, Louella got a part-time job writing for the Dixon Star. By 21, she had begun to write a gossip column about Dixon for the paper. Louella married John Parsons, had a baby girl, and moved to Burlington, Iowa by 1906. It was here that she saw her first movie, The Great Train Robbery (which had been released in 1903). With the failure of her marriage, Louella moved to Chicago in 1912. She sold a script to the Essanay studio; she wrote enough for her to publish a book entitled How to Write for the Movies in 1915. By this time, she had been writing the first gossip column on movie people for the Chicago Record Herald. She was laid off when William Randolph Hearst bought the paper in 1918. At the time, Hearst didn't see the value of movie publicity — but his attitude would change dramatically. Parsons moved to New York City and began writing a movie gossip column for the New York Morning Telegraph, where her writing finally caught Hearst's attention. She joined the Hearst Syndicate, working out of the New York American, in 1923. Although we try to focus on an honoree's accomplishments in films, it it hardly possible to ignore the fact that, of all the scandals Parsons drooled over in her column, her legacy continues to be overshadowed by the death of film director Thomas Ince, who passed away while visiting Hearst and his friends on Hearst's yacht the Oneida in 1924. A story circulated that Hearst had attempted to shoot Charles Chaplin, who Hearst suspected of having an affair with his mistress, Marion Davies, but Ince took the bullet. Ince was quickly taken off the boat and taken to his home in Beverly Hills, where he died. Parsons was on the Oneida at the time of the incident; it has long been suspected that her cozy relationship with Hearst stems from her silence over the truth of the affair. In any case, in 1925, Parsons relocated to Los Angeles in order to recover from tuberculosis. While continuing her column, she recovered, and went on to become a powerful opinion-maker. Parsons continued her enthusiasm over Marion Davies and her films: "give the girl a chance" she would tell her readers. Parson did a walk-on cameo in Davies' film Show People (released in October, 1928). Also during this time, she began a radio program of interviews with celebrities. She eventually had another radio program sprosored by Campbell's Soup called Hollywood Hotel on CBS from 1934 to 1938, and was considered the most glamorous show on the air at the time. Parsons starred in a film version of the show, called Hollywood Hotel (released in January, 1938). She published her first volume of memoirs, The Gay Illiterate, in 1944. Parsons starred in Without Reservations (released in May, 1946), and did a cameo in The Corpse Came C.O.D. (released in June, 1947). She also was in the film Starlift (released in December, 1951, did a voiceover in Susan Slept Here (released in July, 1954, and The Right Approach (released in May, 1961). Her second memoir, Tell it to Louella, was published in 1961. As her influence began to decline, Parsons allowed her column to be ghosted by the writer who would eventually take it over: Dorothy Manners. Pasons officially resigned in 1965. Parsons lived in a nursing home until 1972, when she died of arteriosclerosis at the age of 91. Grauman's Chinese Theatre, Hollywood, California. Louella O. Parsons Forecourt ceremony, Monday, September 30, 1946. 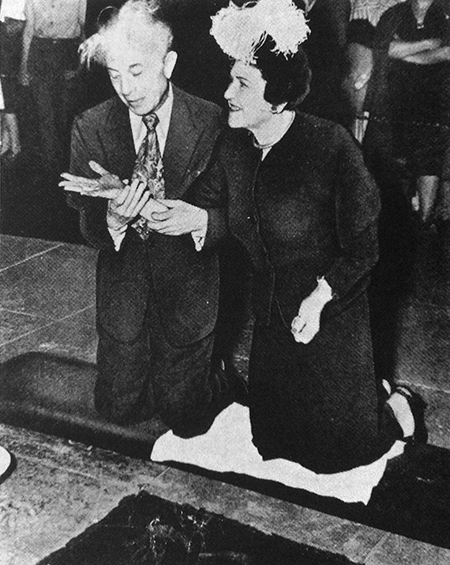 Sid Grauman examines Louella Parson's hand after placing it in the cement.